Bumptop is a pretty awesome desktop organizer :) you will have a 3 dimentional view for your desktop where you can play with your own objects (Pictures, Shortcuts, Stickynotes) and drop them anywere you want, to the wall/on the floor. 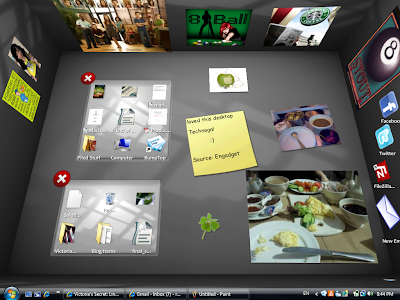 You can also sort a group of items into a pile, resize your objects, and search for a file name on your desktop. Click on the picture to see a closer view. Download Bumptop. 3. What application is that 4 leaf clover icon for? 4. Who are you gonna kill? The software will support touch screen laptops, which Microsoft is working on. 1- Filezilla is an FTP client where you can manage,edit,delete,transfer your website contents/files remotly in a better and faster way from your computer to your website. 3- The clover icon is not an application, it is a simple pic which I really like. Wow, this looks so much better than the boring standard Windows desktop. Definitely downloading it ! Thanks !